There is a litany of asinine and unfair NCAA rules, but perhaps the most blatantly unfair are the transfer rules. With limited exceptions, college athletes playing football, basketball, baseball, and men’s hockey must sit out a year of competition when they transfer schools. Even more onerous, coaches can choose not to grant their transferring players releases to certain schools, barring them from obtaining scholarships and forcing them to pay their own way. The latest battle is at Georgia, where new coach Kirby Smart reversed former coach Mark Richt’s longstanding policy of not restricting transfers, and forbade running back A.J. Turman from obtaining a scholarship anywhere except at a non-UF, non-UM school located in Florida. After a heaping of pressure Smart relented, only keeping the restriction on Miami and Florida. Of course Smart—who makes a minimum of $3.75 million a year to coach a bunch of unpaid adults—wasn’t restricted from transferring within his conference to accept the Georgia coaching job, and didn’t have to sit out a year. He’s right that his policy is in-step with most other schools, but being in-step with other unjust policies isn’t a very compelling argument. SEC rules automatically restrict intra-conference transfers, and even if Smart adopted Richt’s more humane transfer policy, Georgia transfers would still have to sit out a year of competition per NCAA rules. Nearly everybody outside the NCAA bubble recognizes how asinine these restrictions are. In general, one-third of all college students end up transferring during their academic career. All of the reasons non-athlete college students transfer—they don’t like the school, they’re homesick, they want to be in a different academic environment, their financial situation changed, etc.—also apply to college athletes. Athletes are special, though, in that they’re recruited to specific schools in a dizzying and often very personal manner by specific coaches, and are made certain promises by those specific coaches. Why shouldn’t Georgia’s players be allowed to transfer to Miami to continue playing under the coach who helped convince them to attend Georgia in the first place? College football is so time-intensive and cutthroat that most of these players are really choosing a set of coaches at least as much as they are choosing a college. “People forget I spent six years coaching I-AA football, or FCS football. We made a living on four-year transfers that were not happy in their current situation and wanted a new lease on their football career. I’m into student-athlete welfare. I think that, as much as we want the exterior to look like a young man is going to pick a school based on the school and the school alone and it have nothing to do with the people, I think that’s living with our head in the sand a little bit. I think that the current transfer standards are okay where they’re at. If you’re asking my opinion how could they be changed or benefit the student-athlete if there is a coaching change a student-athlete should be able to leave on his own accord and be eligible immediately. It’s a big block of text, but it’s worth reading in full. 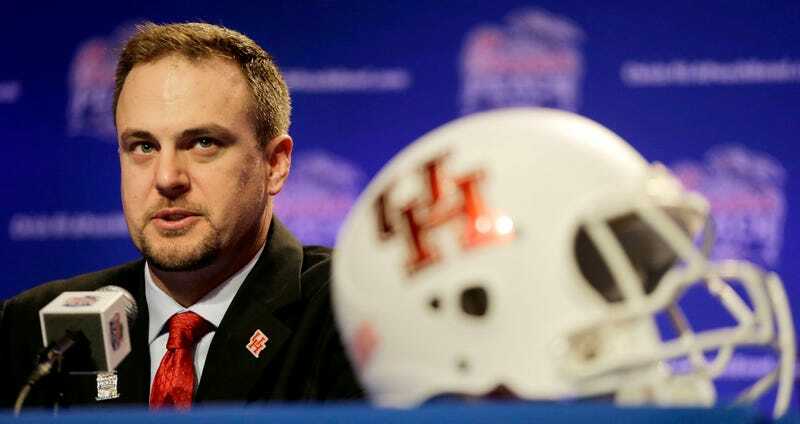 As Herman says, his views are informed by coaching six years at FCS schools Sam Houston State and Texas State, meaning FBS athletes could transfer to his schools without losing a year of eligibility. Herman is no radical. Absent a coaching change, he still thinks there should be a “one-year cooling off period,” an insulting sentiment based upon the idea that these young men need to be protected from their own decisions. But he at least recognizes that high school football players don’t choose a school to be a Michigan Man or whatever, but because they buy what the coaching staff is selling. And if they get bait-and-switched because that coach takes advantage of his freedom to leave, the players shouldn’t be the ones punished for it.